SYN-30 contains 30 mg. of Synephrine HCI per capsule. Synephrine HCI is commonly used to help burn fat, increase energy, and suppress appetite. 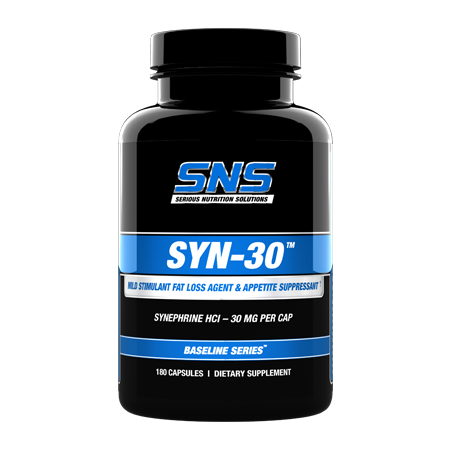 SYN-30 can be cost effectively incorporated into fat loss or body-recomposition regimens and used by those looking for a mild energizer &/or appetite suppressant. Each bottle of SYN-30 provides a minimum 2 month supply! SYN-30 can be stacked with SNS Lean Edge, TTA-500, RK-500 Xtreme, CLA Xtreme, or other select SNS products for improved, synergistic results. This product is for use by healthy adults over 18 years of age. Do not use if you are pregnant or nursing. Do not exceed recommended dosage. Consult a physician or qualified healthcare professional before using this or any dietary supplement, especially if you are at risk for, have been treated for, or are diagnosed with high blood pressure, heart disease, thyroid disease, kidney disease, depression or other psychiatric conditions, renal disease, recurrent headaches, spasms, asthma, or are taking any prescription or OTC medications including but not limited to Monoamine Oxidase Inhibitors (MAOI). Keep stored in a cool dry place away from children.